Finn was a Hen Harrier that was satellite tagged as part of the RSPB's Skydancer project and thanks to funding from Ecotricity. In 2015 I approached the green energy company Ecotricity to ask them to help sponsor a satellite tag as part of the RSPB Skydancer project. The whole team were brilliant, and were quick to agree. It was then a long wait to see how many chicks would be available for tagging after the 2016 breeding season. Finally, in August 2016, Hen Harrier Finn successfully fledged from her nest in Northumberland with a satellite tag on board to track her progress. Normally, a freshly fledged Hen Harrier would hang around it's breeding site for a while, but not Finn. She showed determination from the start. Shortly after fledging she had crossed the Scottish border and then stayed in Scotland and over wintered in South Ayrshire. And she has stayed that side of the border ever since. Once she had fledged, I received regular 2 weekly updates on her progress. Every time the email was slightly late (for very valid reasons each time) I would start to worry that maybe she has become just another statistic and become one of the many Hen Harriers that seem to just disappear over the uplands. My heart wanted to see Finn soar, but my head told me to be realistic about her chances of survival. Finn made life particularly worrying for us as she chose to spend a lot of her time in and around the Leadhills Estate. “I bring some excellent news on Finn, she has a nest on Leadhills. Her data over the last week while had her fixed to the same area and it was looking really likely that she might have been on a nest. So some of the Scottish team headed out to the area yesterday and saw her indeed rise up out of her nest, take food from her mate, eat her meal and return to her nest. 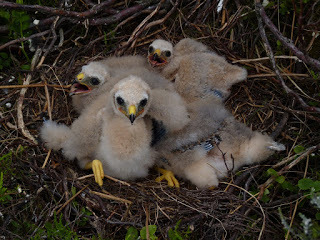 Unusually for a Hen Harrier, Finn bred in her first year and successfully raised one chick. The satellite tag came into its own during this time, as the Skydancer team were quickly able to locate Finn and monitor her safety to reduce the risk of illegal persecution. Throughout the rest of 2017 we continued to get the regular updates on Finn’s progress as she headed away from the breeding grounds. She survived the very cold Winter months, and as Spring approached I started to hope that maybe she would breed again. But the last update was very late coming though. When it did arrive, the news I received was that her satellite tag had stopped transmitting on 25th March, but up until that point the data from her tag suggested that she was alive and well. Her last known position was in south west Scotland near Moffat. She was ranging quite far in her final weeks, mostly over south west Scotland, and never settling in one place for too long. She even visited her 2017 breeding grounds and took a brief visit over the border near Haltwhistle. For her satellite tag to stop working so suddenly is suspicious, therefore I have been unable to post this blog until investigations have taken place and the news breaks officially. And that has given me time to reflect. Finn for me was a beacon of hope. I always knew that following Finn's journey would be a rollercoaster of emotions and I always felt that she was probably living on borrowed time, but she seemed to soar through all the challenges that came her way. In the short time we followed her, we went through every emotion possible; from the excitement of knowing she had safely fledged to the nagging worries that she was settling in high risk areas; and then of course to the worst news of all. As UK Hen Harrier numbers continue to fall (with illegal persecution being high up the list of reasons), she was a vital part of future population recovery hopes. She made an important difference by successfully breeding in her first year, but her luck ran out way too soon. Just 2 years was no where near enough time. But she won't ever be just another statistic; her life mattered; she mattered to me. I am sorry for the bad news, you must have been upset, and so sorry. Just two years. I can't fathom these people's mindset. That's such a shame, so sorry to hear the news. Very sorry Findlay,hope you find strength to carry on. This is sad news. I'm so sorry. Oh Findlay I am so sorry. Thank you for continuing to care and for making a difference. Tears welling in my eyes! What a beautiful story of a remarkable bird, and yet for it to end too soon was just terribly sad! How wonderful that you are doing the work you do, and bringing information about these amazing birds to others. Finn will soar in your heart always I know! This is really bad. When news of such things spreads as far as me, you can be sure that there will be a ground swell of change. We can't believe anything else.